I have allergies. They’re aren’t debilitating or life-threatening, but they are just bad enough to prevent me from being able to breathe through my nose most days of the year. Lord Voldemort has more free and easy nasal air flow than I do. They are the bane of my existence. So a little while ago, I started on an allergy shot regiment. I don’t know if it’s had any effect whatsoever but I think I may have only suffered from 720 sinus infections last year as opposed to the 726 the year before. I have to get them once a week at this large medical facility that is one-half hospital and one-half doctor’s offices and outpatient…places? They are joined in the middle by a state-of-the-art YMCA gym. Walking through the lobby on any given day is like touring a museum exhibition of every possible point between human birth and death. Every week I weave my way past the fittest people I have ever seen and people who, if the automatic sliding doors stay open a little too long, might possibly be blown apart like dandelion spores by a draft of air from the outside. It’s horrifying. But it has become tradition that after every Friday shot session, I stop by the lobby smoothie and wrap station for a fountain Coke and a bag of Cheetos (an ecstasy-inducing combination that nestles me into the weekend). So for me, Chester Cheetah has become both a symbol of healthy human achievement and of creeping, wheezing, gurgling decrepitude. 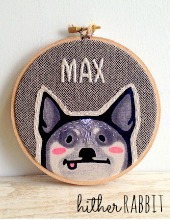 Another thing that is currently in a state of decrepitude (segue!) is my relationship with Frito-Lay. I would like to find the guy at the company who came up with this generic, red, spicy, lime, tomato, garlic, onion powder mix Frito-Lay is throwing on all of their product lines and kick him square in the Funyuns. Such laziness! Let’s throw this powder on some Cheetos. Boom! New product! Throw it on some Doritos. Boom! New product! It’s getting out of hand. If you’ve had any of these reddened Frito-Lay products, then you’ve had all of the reddened Frito-Lay products. The only thing that is ever adjusted is the heat level. 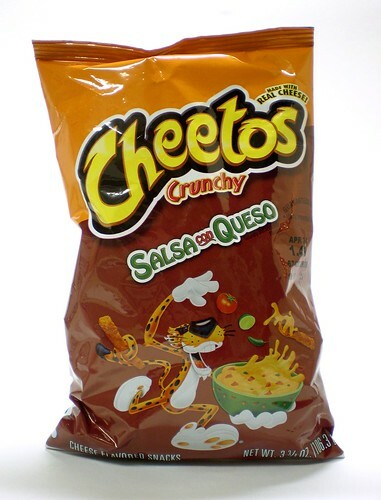 Do these Salsa Con Queso Crunchy Cheetos taste like salsa? No. Do they taste of tomatoes? Maybe…? Are they spicy? A little. This powder is now a flavor. They should just name it Red and be done with it. Cheetos Red, Doritos Red, Fritos Red. At least that’s consistent. Surely it would take the pressure off the marketing guy who has to leaf through his Big Book of Red Things to find something they can use as a flavor name. Needless to say, this bag is already in the garbage. There’s no point. Rein it in Frito-Lay. Chester, talk to your people. And lady in the wheelchair who is possibly already deceased that I just shared an elevator with and is being pushed toward the snack stand, just go with the classic Cheetos. Time is of the essence. Awww, I loved these ones. 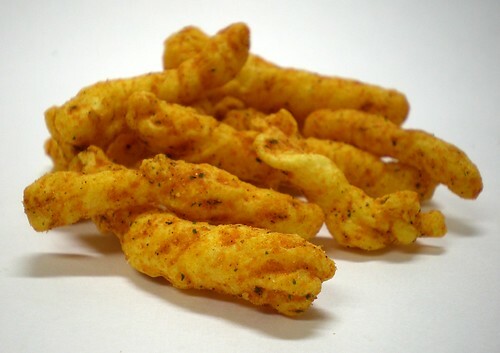 One thing I noticed (that I confirmed with the nutrition facts) is that these are less salty than regular Cheetos. I think I loved them for that reason alone. Too bad I haven’t found them since my initial purchase. They’re not bad. I should revise my review. I just feel like I’ve had them before. I’m not a fan of the flamas either and people love those. To each his own! Ahh, my roadtrips are fueled by Cheetos and Coke (okay, and more technically gasoline). 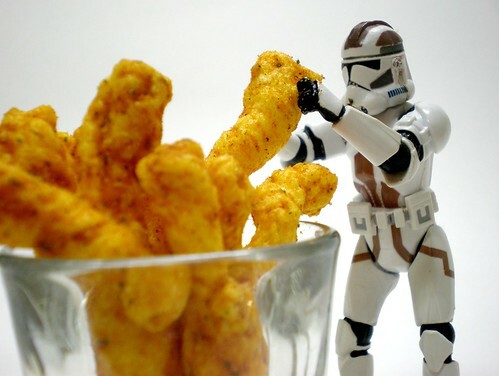 I like the jalapeno Cheetos! But you’re totally right about the Frito La(z)y Red. p.s about the allergies – my dad and my friend’s bro-in-law both had lots of allergy problems and sinus infections, then had some nasal surgery that seemed to fix everything. I’m not a doctor though, so…yeah. Ive heard about the surgery! Though I’m almost positive my next to worthless insurance wouldn’t pay for any of it! 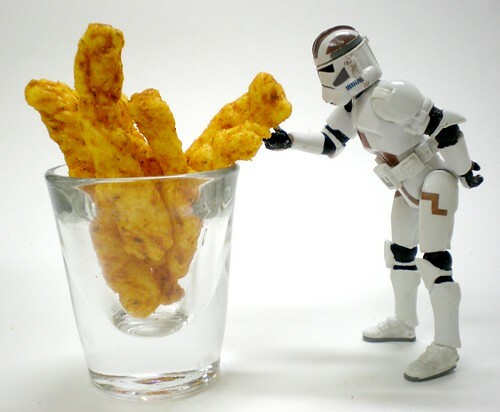 I think I need to try putting Cheetos in shot glasses for my next party…what an ingenious, Martha Stewart-ish idea! Also, I’m jealous…I only wish the hospital that I work at had a gym/smoothie station. I need to know your take on Doritos “spicy nacho”. I’m convinced they’re the best Dorito variety, but of course…I’m not the snack master, so let’s hear it. Don’t know if I’ve had the Spicy Nachos, but I LOVE the Stadium Nachos! Lots of Jalapeno. Im not a fan of the red.I’ll have to pick up a bag. The Cheetos weren’t terrible, just uninteresting. These reviews are quite good. I think I know why you have so many allergies though — look at what you’re putting inside your body each week (not the shots, the food). Haha, thanks for the concern! Surprisingly enough, I eat fairly decently. I never finish anything I write about on the blog. Those Cheetos in the shotglass were all I made it through!